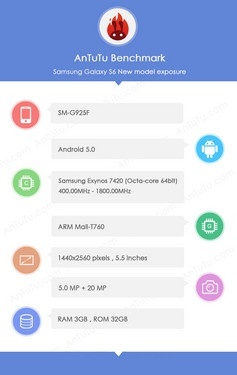 A Chinese website spotted the European version of the Galaxy S6 on the AnTuTu website, revealing a 5.5-inch QHD display and a Samsung Exynos 7420 processor with Mali-T760 graphics. The next-gen flagship smartphone from Samsung has been in the rumor mill for a while already and now it seems that some previously leaked specs got confirmed. While this is not an official statement of the South Korean company yet, a list of specs from the AnTuTu database can be very close to the final highlights of the device. According to PhoneArena's assumption, the Galaxy S6 will be introduced about the same time as its predecessor last year, which was announced in February and released in April. If they are right, the next-gen Galaxy smartphone should hit the stores before next summer.